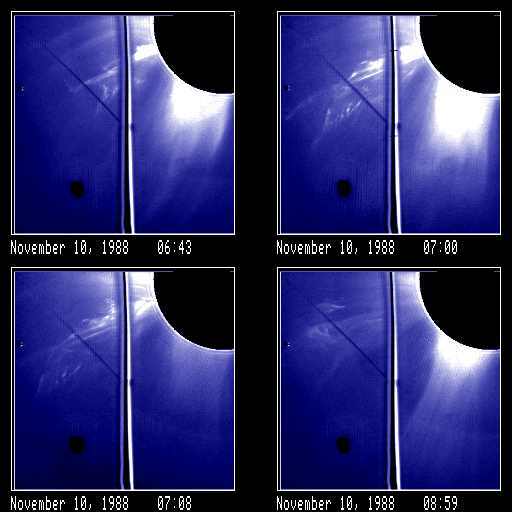 This is the first of two coronal mass ejections observed by the SMM coronagraph on November 10, 1988. In this event, highly structured material (probably a prominence) was ejected over the east limb of the sun. At 10:41 UT a second mass ejection was observed over the northwest limb of the sun. Solar north is toward the upper left corner in each image. Beautiful, highly structured (prominence) material. Could have missed coronal front of event between 05:43 and 06:43 images. Material ejected on both sides of (prominence) material. Small streamer at northern edge of event is disrupted. Flat-topped loop/cavity wirh probable (indistinct) core superposed on streamer. Loop gets flatter (dimpled) as it moves outward. November 10, 1988: 11:25 UT November 10, 1988: 11:25 UT Subt. November 10, 1988: 11:41 UT November 10, 1988: 11:41 UT Subt. November 10, 1988: 11:58 UT November 10, 1988: 11:58 UT Subt. November 10, 1988: 12:14 UT November 10, 1988: 12:14 UT Subt.